E.W. Burman Inc. is a three-generation, family-owned commercial construction company that has fostered successful growth by observing how bigger firms handle operations – and then going in the other direction. “My father worked for a large construction company and didn’t feel they were working to please customers,” said Edward W. Burman Jr., son of the company’s founder, Edward W. Burman. So, Edward Burman started E.W. Burman Inc. in 1964. His wife, Edward Jr.’s mother, Martha, was the company’s secretary, later becoming chairman of the board. Though both have since died (Edward in 1977 and Martha in 2014, just shy of 100 years old), not much has changed at E.W. Burman of Warwick. It’s still a family business serving Rhode Island and southeastern Massachusetts. Edward Burman Jr. is president and his brother Paul Burman is treasurer. 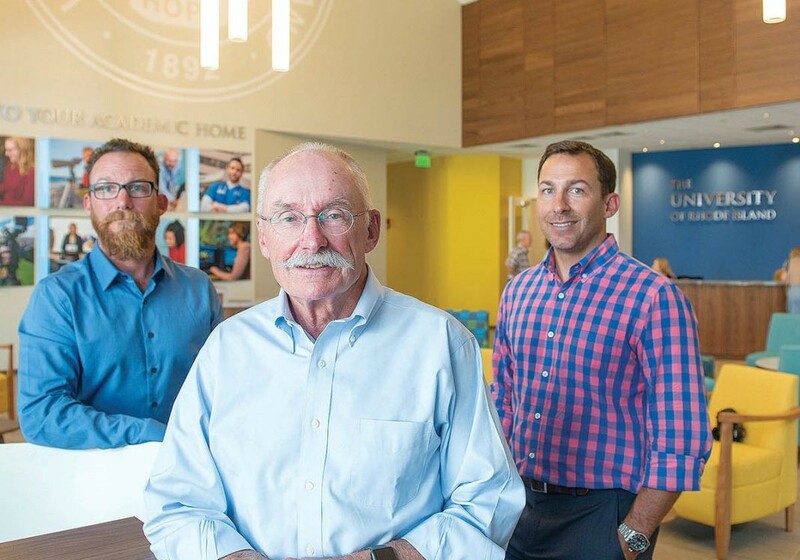 The Burman brothers’ sons also work for the company: Edward “Tripp” Burman III, Andrew Burman and Patrick Burman are part of the firm, along with about 40 other employees – 10 added in the past five years or so. “We kind of thrive on that tradition. Not only do we have three generations here in the office … we’re on third generations out in the field as well,” Burman said. The brothers, as principals, deal directly with clients. Edward Burman Jr. personally visits work sites to ensure all teams are working together and to help keep projects running on time and on budget. The projects are almost a historical timeline of Rhode Island itself. E.W. Burman built the iconic La Pigna arch on Federal Hill, for example. The company has renovated interiors of The Biltmore and the University Club; built the University of Rhode Island’s Harrington School of Communication and Media as well as the school’s new welcome center; the Jesse M. Smith Library in Burrillville and South County Hospital’s Center for Women’s Health. It also handled construction of the Carter Center for Music Education for Rhode Island Philharmonic and, more recently, the state-of-the-art University Orthopedics facility in East Providence, to name just a few. “We’re open to considering many projects, which you kind of have to be in a small state like Rhode Island,” he said. “I’d say we specialize in historic renovations, hospitals and education. We don’t build any roads or houses,” Burman said. Though the company stays true to its roots of committed customer service and remains small enough to stay nimble, it’s the economy that often dictates growth, to some extent. But a rooted legacy of quality work at its core has helped the company’s success when other factors fluctuate. Medical construction and renovation, meanwhile, is a strong market. “Health care is an ever-evolving situation, mainly having to do with the technology; it is constantly changing, the equipment, diagnostics … they need renovations or expansions to accommodate,” Burman said. As a child, Burman remembers his father saying to him, “ ‘Don’t come to me with problems; come to me with solutions,’ ” he said. That’s a lot easier to do in business when the company is small, flexible and can pivot when needed, Burman noted. “We’ll take slow growth. We have no ambitions to become a regional contractor,” said Burman. Burman remembers the time the team was working on a project for Providence’s Clifford Metal years ago, and steel beams, which were more than 100 feet long, being delivered by train, were lost. Or when the company was working in Newport and needed insulation as part of the job. The factory manufacturing the insulation burned to the ground. “You have to be agile” to respond to those kind of curveballs in ways that will serve clients and help a company grow its reputation for excellence, he said – a practice E.W. Burman has perfected over decades.